ðŸ’¡HOW in the world can I find contentment in my Singleness? ðŸ’¡Is it really worth working on inner healing when NO ONE else seems to be doing the same? ðŸ’¡What am I supposed to do when it seems like everyone is in a happy relationship but me? You aren't alone! 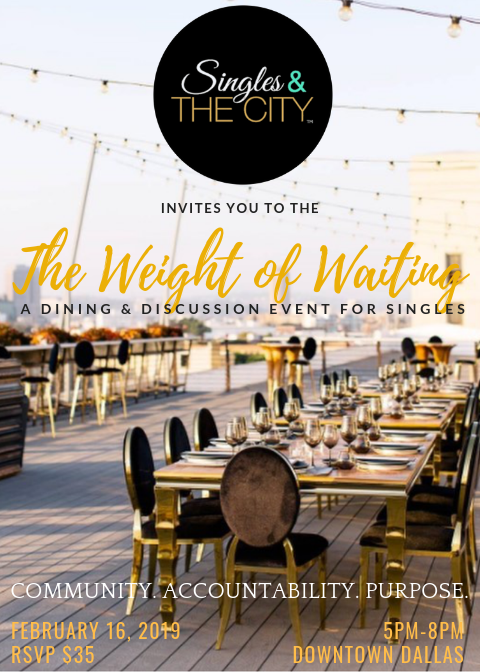 Join us for â€œThe Weight of Waiting" - an empowering event with fresh perspective from those who have encountered trial, error and gained victories in goal setting, business, relationships and Christian spirituality. This is the ULTIMATE ROUNDTABLE & PANEL DISCUSSION FOR SINGLE & DATING PROFESSIONALS!